Col. Rex Applegate and William E. Fairbairn are legends. The two adapted the Fairbairn-Sykes fighting knife to create a stronger and more robust fighting knife aptly called the Applegate-Fairbairn fighting knife. The fixed blade dagger was a work of art that served admirably in combat. Applegate eventually went to knifemaker Bill Harsey Jr to adapt the design into a folder for Gerber. The result was the award-winning Gerber folding Applegate-Fairbairn fighting knife. 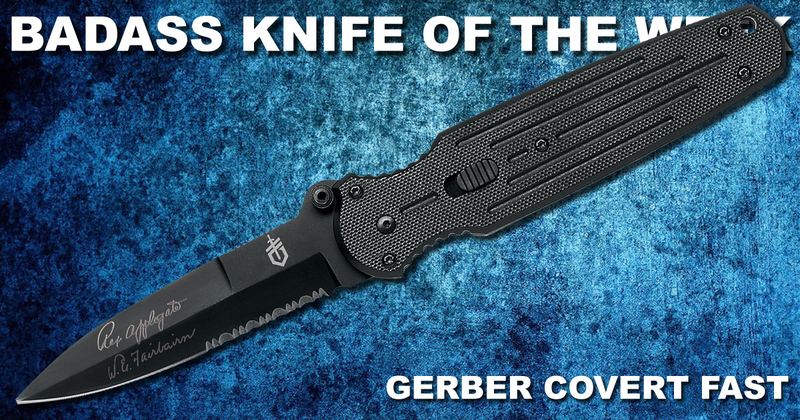 Gerber has since improved upon the design and even made a budget version of the knife called the Gerber Covert FAST. The Covert FAST has the same overall design with a 3.7-inch dagger-inspired blade with partial serrations. Featuring the signatures of Applegate and Fairbairn on the black titanium-coated high carbon surgical stainless steel blade, this version boasts Gerber’s assisted technology called FAST. That means the blade springs to life with the push of the thumb stud. The blade stays engaged with the help of a side lock mechanism that locks the blade open or shut. It’s easy to use and makes one-handed operation a cinch. G-10 handle scales are reliably grippy and mimic the handle of the original fighting knife. A tip-down pocket clip makes this a solid EDC option with decades of history behind it. You can also pick up the US-made version with better materials here or the mini version here.